As someone who works in social media I look at the ads I get served on Facebook with a professional interest. 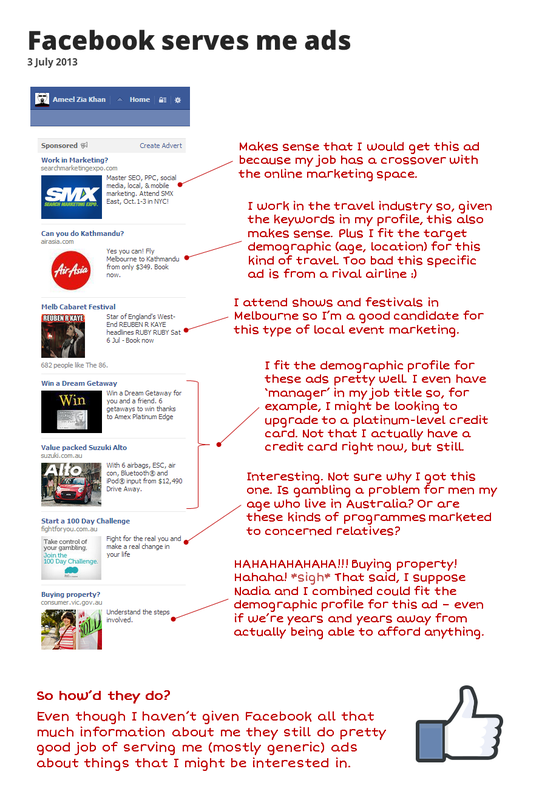 Given that I haven't actually put that much information about myself on Facebook, it's fun to see how good (or bad) a job marketers and ad buyers have done in targeting those ads to me. Of course Facebook does have a lot of my demographic data as well as my detailed social graph (though I do keep getting asked to "complete my profile", which is entertaining). It also has a history of all my likes, comments, and shares; each of which probably has multiple keyword and category associations. What ads do you get served on Facebook? And are they any good?